George Bush not only made the term "compassionate conservatism" a common phrase but also showed what a joke it is. Speaking to an audience of hundreds at a meeting here of business lobby Wisconsin Manufacturers & Commerce, Walker said his plan would cover somewhat fewer people than a full expansion of Medicaid as provided under the federal health care law, which he said would cover 252,700 people, or 28,100 more than his own approach. But the Republican governor said that his proposal, which shrinks state health programs by a few thousand patients, would reduce the role of government in people's lives and make them more independent. "Some people will portray this as not caring about people. I think it's just the opposite. I care too much about the people of this state not to empower them to control their own destiny," Walker told the audience. Don't you just get the feeling that he is going to just love all the poor people to death? Compassionate Conservatism is another way of saying war is peace, freedom is slavery, and ignorance is strength. We would all like to see him get more people in the work force.............but he hasn't and denying them health coverage isn't going to get them a job! But he does believe that if he can insist that lots of people pee in his cup they'll rapidly find employment! He's a joke!!!! As far as public policy goes, "compassionate conservativism" dealt with welfare reform. It was financed by the Bradley Foundation, who granted Bradley Scholar Marvin Olasky, a U of Texas prof working at Heritage Foundation money in 1989 to pen "The Tragedy of American Compassion." Olasky argued that 19th-century models of religious-based charity were preferable to the welfare state. This truly is the bizarro worldview that influenced Dennis Smith at the Heritage Foundation before he came here to create Scott Walker's healthcare policies. 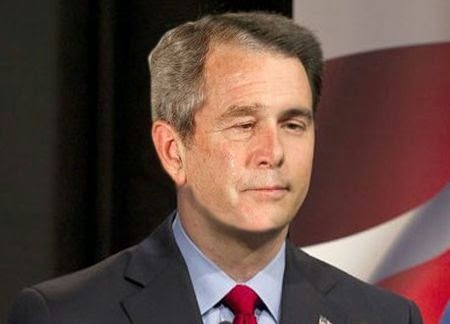 If it were not for the Wisconsin GOP, SKW would be working a minimum wage job and be on Medicade.